Jaguar-Land Rover of Peoria is excited to announce the launch of a brand new website exclusively dedicated to showcasing Used Land Rovers in Illinois. If you are in the market for a used, pre-owned or Certified Land Rover in Chicago, Peoria, Springfield, Decatur, Champaign, Rockford or St. Louis, then you should should start your search here. 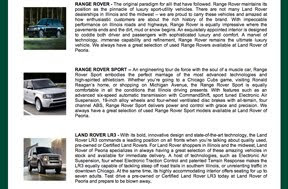 We have updated specials, Land Rover videos, detailed descriptions, multiple photos and all the information you need to make an informed decision about purchasing a used Range Rover or Land Rover from an experienced dealership in Illinois. Visit us today and save on a new, used or certified Land Rover. We will be happy to make your dreams come true.